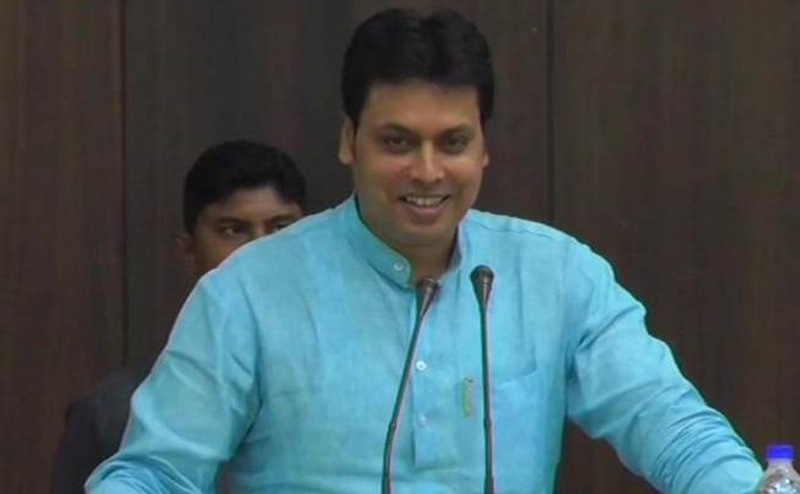 The new BJP-IPFT government in Tripura in its first 100 days has seized more than double contraband of last two years of Left Front under Manik Sarkar, claimed Chief Minister Biplab Kumar Deb in the Assembly. Giving details of the contraband seized, Chief Minister Deb in the House said, “Since February 9, 2018 to June 16, 2018, a total of 12035 kg of marijuana, 50116 bottles of contraband cough syrup, 564.4 gram of brown sugar and heroin, 33144 tablets beside 27 vehicles used for drug trafficking and cash Rs 453740 and Bangladesh currency Taka 26,00 was recovered by the security agencies. Again two lakh marijuana saplings were destroyed and as many as 79 persons engaged with drug trafficking were arrested during the same period and 117 cases registered, he further said. He claimed the amount of contraband and ganja recovered is more than what the previous CPI-M led Left Front government under former Chief Minister Manik Sarkar did in its last two years of rule. During the year 2016 and 2017 under the previous government, the total marijuana recovered was 5338 kilogram, while 127 were arrested and 139 cases were registered, Deb told the Assembly on Monday. He urged people, members of the House including the opposition bench, to support the drive of the government against drugs to make Tripura a drug free state. Meanwhile, Sushanata Chowdhury, one of the youngest members on the treasury bench, pointed out that there has been a spurt in the number of HIV cases at Damcherrra owing to use of contaminated needles for substance abuse and it is one of the prime entry points of drugs from Myanmar via Mizoram. The Chief Minister said that the law enforcement agencies in the State have been keeping a ‘close watch’ on a drug trafficking route that originates in Myanmar and enters Damcherra, a remote village in North Tripura district, through Mizoram. The BJP-IPFT government has ‘vowed’ to put an end to drug menace in the State, Deb further asserted. “The government and law enforcement agencies are on the move to block the drug smuggling route as it poses threat to the younger generation at Damcherra area, adjacent to Mizoram,” the Chief Minister told the House during a calling attention motion initiated by government chief whip Kalyani Roy.